Le vent, se lève!… Il faut tenter de vivre! I have such conflicted feelings about this movie! Much of it is a disappointment of expectations, though. 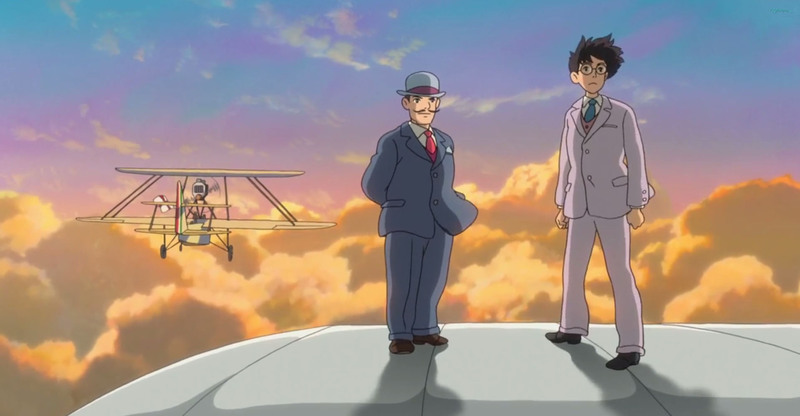 The Wind Rises is a highly-fictionalized film about real-life person Jiro Horikoshi, who is most famous for being the designer of the infamous Japanese A6M “Zero” fighter plane for WWII. In movies about famous artists, designer, architects, or what-have-yous, I have a certain minimum expectation: I expect to learn about the hows and whys of the creative process that led them to their most famous work(s). How shocked and frustrated I was, then, when this film ends (spoiler alert) with the test flight of the prototype of the A5M—the fighter that came before the A6M Zero! In fact, much of the movie hinges on Horikoshi’s thoughts on an inverted gull-wing shape that is used in the prototype of the A5M—but which is not actually used in the final version of the A5M, let alone the Zero! The scenes that interested me most were the ones where Horikoshi makes a breakthrough of some sort in the design of his planes. The introduction of flush rivets, for example. The design of wing strut supports. Laughing with his team about how to reduce weight when the military demands two gigantic machine guns be mounted to the plane. In other words, the creative side of things. Less interesting to me was the dying-girl romance between Horikoshi and his wife. Especially because it was completely fictional, and too perfect to find interesting. Horikoshi’s wife is the absolute perfect 1930s Japanese woman. There is no conflict in their relationship, only the specter of chronic illness. Guess what my least-favorite genre of movie is? The dying-girl romance. Horikoshi himself is portrayed as such a meek milquetoast that if it weren’t for his unending creative drive there would be little of interest at all in this relationship. The main theme of the film is handled exceptionally, though, that of creativity versus the exploitation of creativity. Hirokoshi is designing essentially war machines, but he has no love for war at all; it is the sheer creative and artistic process that drives him to design these planes, not any patriotism or idealism. He expresses great ambivalence about the way his designs are being used to essentially kill people. He believes he is creating something beautiful; but his beautiful creations are being used in less-than-benign ways. Does that negate the beauty of their design? Is the end-use usage of a creation inextricably entwined with its design? Or can the beauty of the design be held separately from the horror of its usage? Wisely, I think, the film never takes a stance either way, and the whole complexity of the situation is simply presented for the viewer to think about. In a wonderful ending dream sequence that takes place after the war, Hirokoshi sighs as a fleet of Zeros (the ony time they’re ever presented on screen) flies away. They are beautiful planes. So the film is visually spectacular, of course. Especially wonderful are dream sequences of fanciful, old-fashioned airplanes. And dynamic scenes of harrowing test flights are great. But much of this is visually similar to the fantastic Porco Rosso, so I didn’t feel like I was seeing much new there. Scenes of 1920s & 1930s Japan and Germany are extremely detailed and specific. So is this a good movie or not? It is enjoyable in many parts, and fascinating in many parts, and certainly gorgeous. The ambiguities of creativity and war and the corruption of beauty are handled very well. It also has an hilarious and bizarre Big Gay German in it. But it also feels somehow insubstantial and frustrating, focusing too long on the things that interested me the least and too little on the things that interested me the most. So, three stars sound good? Yeah, I suppose. Tags: Hayao Miyazaki, The Wind Rises.